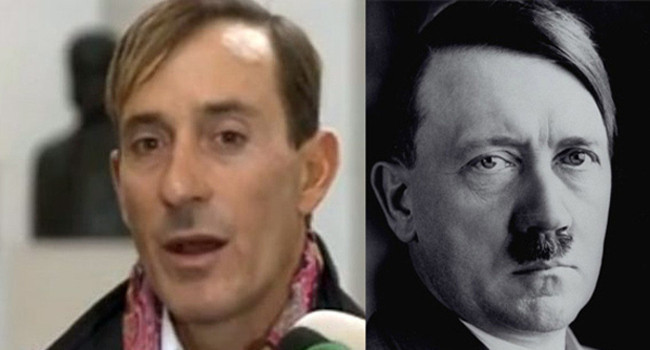 November 21, 2014 ~ Lorra B.
saying that the recent look of Radu Mazare, the mayor of seaside resort Constanta, has deliberately copied the haircut and mustache of Adolf Hitler, the most famous german leader of all time. They consider Mazare’s gesture to be “outrageous and provocative,” according to MCA Romania. Moreover, the fact that this new look comes after a German ethnic was elected President of Romania it is seen as “a defiance”. Radu Mazare inaugurated his new look before the first round of the presidential elections, but it triggered no responses so far, according to Hotnews.ro. The mayor however said his haircut was popular in the 1920s, and that he has seen a lot of young people wearing it nowadays, when it made a comeback. He also said, quoted by Adevarul.ro, that he never had a moustache. He however appeared to have a hint of a moustache when interviewed for TV in the last couple of days. Mazare is known for his “controversial” outfits and appearances. Back in 2009 he was criticized for appearing in public in a National Socialist uniform. He later admitted “it was a mistake” and appologized for it. This entry was posted in News, Politics and tagged Adolf Hitler, Combating Anti-Semitism, Hitler, Radu Mazare. Bookmark the permalink.